Welcome to the original Madhurifan site. Earlier, this section had a lot of articles, pictures, videos, and my other collection, however, I removed it gradually and summarized here in a better format. Yeah, you read it right. Those are "my" songs. "My" acts! You can find some of my dances on Madhuri Dixit's Songs / Dialogues on Instagram: (@dancewithsagar). Follow @dancewithsagar on Instagram for my dance videos. I showed her my 20 years of collection of her photos, newspaper cuttings, articles, right from 1992 to 2012. To add to that, people said that they liked my smile and dance. Be it in school, college, or office, I don't remember how I used to let people know that I am one of the biggest Madhurifans. Now, they call me the male version of Madhuri Dixit. People always knew me better as a Madhurifan, with one of the best names someone gave me, "Madya". Some people say that I am spiritually connected with her. Most of them call me "mad" (pun unintended), but from what I mostly see, people are amazed more than anything else. This is the Facebook Post embedded on my Official Facebook Page. It is interesting and lovely to know that people remember me whenever they watch Madhuri on TV or in newspapers. Whenever my well-wishers (from office, family, or anywhere else) see her photos / posters / wax statue, they say that they remember me, and I don't think there can be a bigger compliment than this! I remember one of my colleagues went to the U.S., and he saw a huge poster of Madhuri Dixit's in a restaurant there. He clicked the photo and sent it to me over official email telling me that he remembered me on seeing it. There are countless such lovely moments. I had written a letter to her in 1993 and had received her reply too with a photo and some stuff printed behind it. The envelope was torn, and something was stolen out of it, and I cried that day. I have hundreds of her photos, newspaper cuttings, etc. collected since the year of Beta. I remember how my school-mates used to sell me those so-called original photos of HAHK for Rs. 5/- each and that too used to be so costly then. Otherwise, post-card size photos costing Re. 1/- then - that typical paper-make I can still remember. I'm really amazed at myself as to how I have maintained all those pictures till date. I had stored all of that in a brown-colored Brief Case. It was only a few months before meeting her that I got the chance to stick most of them properly into a huge wedding album. It was not done with the intention of showing it to her, but just as part of my self-organization. You can see the album by clicking here. 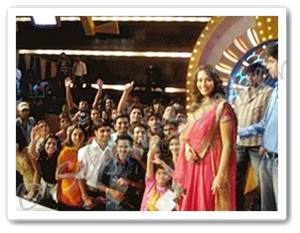 I got an opportunity to be part of the audience in the Nach Baliye-3 show on 26th November 2007 (when she was there for promoting Aaja Nachle) with the Orkut's Group and got to see Madhuri in person. We clicked a group picture with her, which was enough for a memory. Couldn't talk or "meet her" as such though, but I was glad I got to see the person I admired since childhood. You must hear that overall day's experience from me in-person. That was the same year when I launched the website www.madhurifan.com. I held quite a few Madhurifan Contests, and gifted quite a few innovative prizes to winners. It was fun. 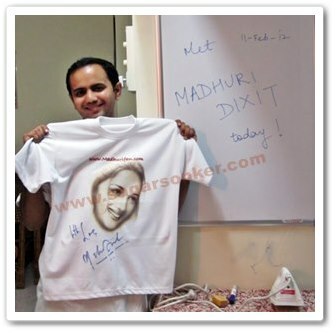 One of them, I remember, is the Madhurifan T-shirt - with Madhuri's photo printed on it. I am glad to have pioneered this idea. I tried a couple of more chances to meet her, but in vain, however, last time I decided that I wouldn't aspire to meet her again. 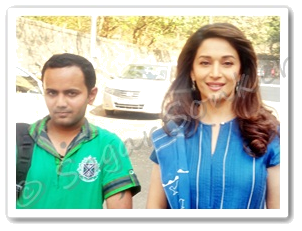 I got this gifted opportunity to meet her on the 11-Feb-2012 at Film City, Goregaon, Mumbai outside her vanity van. This was the same day when Madhuri mimicking various artists (Vidya Balan, SRK, Dhanush, Charlie Chaplin, Mithun-ji, etc.) was being done inside. We were standing right outside and hearing the claps. While taking that huge album to her, I told her that I'd trouble her a bit by showing it to her, to which she replied, "No, not at all", and she was really very happy to see it. Her driver was kind enough to help me uncover the album. That album contains similarities between me and her on the first page, and she smiled on reading that. She saw the entire album, page-by-page, told me that she didn't remember most of them, and was very glad to see some rare ones too. She called that album a 'pothi' (means codex in Hindi). Her mere statement mentioning - I must have taken so much trouble maintaining that album - paid-off all the hard-work and efforts I took in maintaining that collection. She thanked me many times while seeing all the pages. Took her autograph on the last cover page, and later also took a t-shirt that I had printed long ago and took her autograph on that too. And the pictures with her followed. I am deeply thankful to Nitesh and Smita for clicking my pictures and the video. 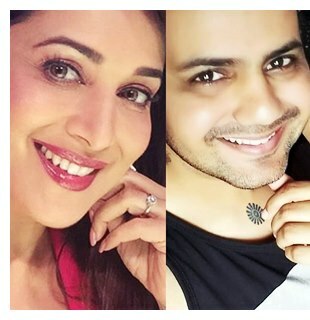 They both are two other big Madhuri Dixit fans. It was a nice experience meeting Madhuri Dixit in-person. Meeting her was the culmination of my Madhurifan-ship. I had planned to meet Madhuri's wax statue at Madame Tussauds, London if I couldn't meet her until 31-Mar-2012, but I am really glad that I met her before 'meeting' the statue . Some people bluntly say, "You're lucky you got to meet her", or "I'm jealous of you", without knowing the hard work and perseverance that was done in the background for over 20 years. This write-up cannot end without thanking all my fans and well-wishers, who clicked a simple LIKE button on Facebook and helped my 20 years of wish finally fructify. More than me, I think they were all happy that I met Madhuri Dixit. "You deserved to win this contest and meet her", was the best thing to hear. I do not belong to any Madhuri Dixit Fan Club, Group, or Community, and neither did meet her as part of any group. It was like as-if the Universe orchestrated it for me with the help of all those who knew how big a Madhurifan I've been. My love and wishes to each and every one of them. I will cherish the moments of meeting her for the rest of my life. Her songs are still in my daily Playlist. I still watch her dances and movies regularly and repeatedly. She has been a very very important contributor to my life. I have watched HAHK more than 40 times by now, many other movies countless times, Dedh Ishqiya thrice on theatre. For Aaja Nachle, I had treated 20 of my co-workers to this movie by booking seats for them. No wonder people call us Soulmates. I did NOT know she had such a Selfie (the one you see here). I don't and cannot compare myself to her, and I cannot pose like her, because I don't want to be like her! We are already one! ♦ We both are Taureans, our father's names are Shankar, her nickname is Babli and mine is Bablu, we both detest roaches. ♦ 1990s were the peak of the foundation her career and my education - which has made me what I am today. Without having studied in St. Sebastian High School, Daund, I wouldn't have been what I am today at all. ♦ She left her hometown in 1998-99 after getting married, and I left mine after completing my SSC. ♦ She still gave hits after that in the beginning of 2000, and so did I - was the 8th ranker in Pune University during HSC (12th), and the 1st ranker in Sinhgad Engineering College, IT Department. ♦ Then there were many changes in life. She had kids, I had the beginning of my career. ♦ When she returned with Aaja Nachle (playing the role of Dia, a divorced woman), I got divorced during that year as well. ♦ That movie's name automatically and naturally brought dance BACK into my life. I joined a Dance Class and performed in their shows across Pune as well. ♦ She decided to comeback to India (one of her best decisions ever - from her as well as her fans' point of view) and settle down, which is only when I got the chance to meet her. ♦ She played the freedom-seeking Begum Para in Dedh Ishqiya in January 2014, and I quit my IT Software job at the peak of my career in the same month, for a similar reason. ♦ Now, while she's enjoying her Dance Academy DancewithMadhuri.com, I'm enjoying my Life Coaching ventures, however, while she's definitely looking forward to and open to good roles (while rejecting many on the way), I'm also looking forward to and open for a good role in my field (while rejecting many on the way). ♦ The day I launched my Official Personal Facebook Page (25th January, 2018), one of my acquaintances passed away. The day her Production Company's (rnmmovingpictures) venture started (24th February, 2018), Sridevi passed away.